Its getting close to that time of year again when our alpacas get their haircuts! That warm fiber has kept them throughout the winter but come April it starts to get too warm. April 6th, 2019 around 3:00 p.m. is our day and time. Please feel free to stop by and watch! We will be joined by two other farms – The Alpaca Project and Swine Knot. A total of 19 alpaca and two sheep will be done that day. If you are interested in watching and learning about shearing…come on out and join us! We’d love to meet you! April 18th around 2:00 p.m is our 2018 Shearing date at Rockville Alpaca Farm. Anyone is welcome to come and watch as 18 alpacas get their heavy coats off for the summer. If you’ve never witnessed a shearing, it is an interesting event. As you can see, Maxwell is ready! April 17, 2016 – Sunday – was a great time with “Circle of Friends” from Weinstein JCC in Richmond. A super group of folks who wanted to get up close and personal with some alpacas! Lots of questions, lots of hand feeding alpacas, lots of laughing – they even got to see two of our adult males having a disagreement. The weather was perfect for a picnic lunch alongside our “girls” who were very curious as to what was going on. 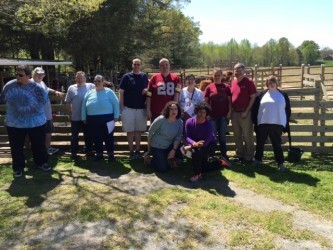 Thanks to Melissa for contacting our farm and bringing this group for a visit and for LaVenus for driving the bus. Dan and I had a great time watching the excited faces interacting with the alpacas. We would love to have them back anytime for more alpaca fun. Our new baby girl arrived right on her due date – Oct. 17th! Echo’s baby girl is a beautiful brown with those huge black eyes! She was 16lbs when born and all legs. The delivery went well (whew), the weather was great and had help from our neighbor Eddie. Come by and see our girl…she’s so cute! Our Echo is expecting her first cria! Oct. 17th is her due date, but you just never know when its a “first”. So we are checking Echo several times a day looking for signs that she may be in labor. We also don’t wander too far from home in case her baby arrives ahead of schedule. I’ve put a pink collar around her neck so if you are driving by and want to know who is expecting, just look for the pink collar. If you drive by and see a little one prancing around with her momma, then you know the event took place. Please feel free to stop and get a closer look. 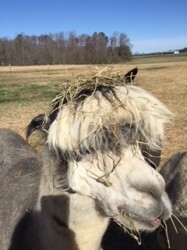 Shearing Day at Rockville Alpaca Farm is April 13th this year around 12:00 p.m. Anyone interested in helping/watching is welcome to come on over. We can always use extra hands! The alpacas will be ready to shed those heavy coats that have kept them warm all winter! We always enjoy having visitors at our farm….the alpacas love the extra attention (and the extra grain). If you are interested in seeing the alpacas, give me a call or send an email to arrange a time. 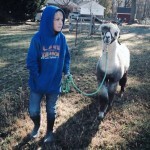 (Info on Contact Us page) Kids love alpacas…its a nice outing for the family. My alpacas are mostly gentle and very receptive to people being in the pen with them. Come and see us – anytime! Pet an alpaca…..you’ll be glad you did. Once again, Rockville Alpaca Farm will be at “Christmas on MacArthur” for the annual Christmas Parade! Family Fun! Photos with Santa, Parade, prizes, Arts and Crafts, Alpaca Product. Bring an unwrapped gift for Toys for Tots drive. 6 free bikes will be given away. Antique cars and trucks, VA State Police, Richmond Fire Dept, Bands, a choir and more. Come on out and join us for a great day! 11:00 a.m. till 4:00 p.m.
Sept. 19-20-21st….. 2014 Field Day of the Past starts tomorrow! If you’re looking for a good time, come on out and join the fun. Lots to see and do. Lots to eat! Rides for the kiddies, animals (Alpacas), demonstrations, vendors…something for everyone! Rockville Alpaca Farm will be there on Saturday in the 4-H area. Come and say “Hi”! MAY 17th FARM DAY at Rockville Alpaca Farm! Hope y’all can come out and join us……lots going on. Shearing demos, spinning demos, Alpaca Obstacle Course Training Demos…..plus vendors with alpaca products. I know of two little goats who will be visiting us that day! Rockville Deli has agreed to provide food and beverages again this year in case hunger strikes you. Some kids activities….walk an alpaca……photos with an alpaca…..artist contest……Scavenger Hunt. Come on out and enjoy the day with friends and neighbors in beautiful Rockville.